Residents of Abakaliki, the Ebonyi State capital, and its environs, have boycotted the free medical treatment organised by the Nigerian Army in the areas. 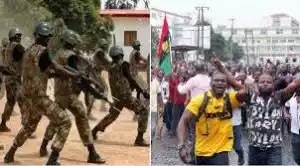 The boycott, Daily Sun gathered, might not be unconnected to the inversion of Umuahia and other communities in Abia State by soldiers who reportedly left some IPOB members dead and others severely injured. To show solidarity to their battered Abia State brothers, many residents of about seven communities in Abakaliki council area, which were expected to benefit from the military’s free medical care, boycotted it. Daily Sun gathered that few persons who came attended the flag-off came from Nkwagu Military Cantonment. Chief of Army Staff, Lt. Gen. Tukur Buratai, while inaugurating the exercise at Nkwagu Primary School, in Abakaliki, stated that the free medical exercise was meant to foster military-civilian relationship within the zone. He said that the army was concerned about the healthcare of the people and decided to also embark on the programme. Declaring the exercise open, Governor David Umahi of Ebonyi State ,who was represented by his deputy, Dr. Kelechi Igwe, thanked the military for its initiative aimed at meeting the health needs of Ebonyi people. He praised the military for protecting the territorial integrity of the country and pledged that the state will continue to support the military for the sustainability of peace and unity of the nation. In his remarks, the Chairman of Abakaliki Local Government Area of the state, Emmanuel Nwangele, blamed the low turnout of participants on the Abia State experience. “People are afraid following what is happening in the society. They have never seen the Army carrying out such gesture” he said.